Ahh what a weekend!! I will be doing a full recap post on the Liverpool marathon very soon so bear with me. What I will say for now is that it went really well and I enjoyed it a lot! I got a PB and my shin/calf niggle held out fabulously. In fact, and I absolutely have no understanding of this, it felt better the day after the marathon than it did leading up. WHAT IS THAT ABOUT!? I do have a slight sneaking suspicion that in my usual pre-marathon panic and general fear of injury that I might have foam rolled and poked self-massaged the area in question too much. I’m not one of those “sit tight and it will go away” type people…I have to prod, poke and foam roll. I’m wondering if the high mileage from the previous week made it slightly grumpy and then I pushed it over the edge in my panic? I suppose the real test will be when I get back to running again. Anyway I’ll roll back to the days before. On Friday after work my dad and me drove up to Stoke-On-Trent. This is around a 3.5 hours car journey. Though we stopped for some food half-way. I try and encourage my dad to eat healthily pretty much most of the time…some could describe me as a bit of a nag but I like to say “Health Coach” 😉 As he was driving all the way I thought a KFC treat would be alright so I turned off my nag alarm. 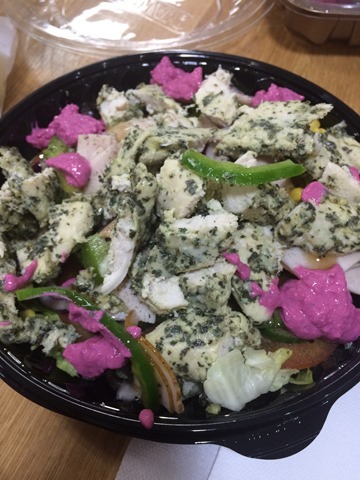 I went for a Subway turkey salad which I added pre-cooked pesto chicken from Waitrose and some luminous beetroot dip. This was SO good and chocka full of tasty toppings. I was stuffed!! We got to my granddad’s around 8.30pm and he welcomed us in with a lovely cup of tea. I love my granddad’s tea. I have no idea why it’s so good but it’s just so refreshing. He is one of those people who literally makes about 10 cups of tea throughout the day. He’d also prepared some meringue nests dipped in chocolate with some chocolate strawberries as well. Perfect! We caught up and then watched TFIF and I felt very relaxed and content. I even stayed up until 10.30pm! Madness eh? The next morning I’d planned to do the local Hanley parkrun. It was literally a five minute drive from my granddad’s so it meant quite a nice lie-in. I was worried though as my shin/calf was still not right. It was feeling better, but still not 100%. I wanted to do the parkrun though as I had to know what I was in for on Sunday, good or bad. After doing some investigation on Twitter I’d found that the course profile was ‘challenging’. Well I wasn’t going for a good time anyway as this was just supposed to be a nice shakeout run and testing the waters. My dad drove me down and stayed to support. As I’ve said before, my dad loves to watch my races. He’s very proud of my running and he loves supporting. He ‘gets’ it. He understands my love for it and the intricacies involved in pacing, training, injuries etc. more than a lay person (probably because I talk so much about to him!). Before a race, he’ll talks ‘strategy’ with me and ask what paces I’m aiming for so he knows when I’ll come by and the goal I’m aiming for. He also, bless him, will always point out someone he thinks looks speedy or I should watch out for (even when I say I’m not racing!!). He’s a proud dad and loves being involved. And I love him being there of course! And it’s great because he’ll always tell me funny or interesting stories of what he’s seen while he’s been supporting – always interesting to hear the perspective of a supporter! Back to parkrun…It was raining but it wasn’t cold. The Hanley parkrun guys were so friendly and welcoming. We all stood under the shelter of a bandstand and I chatted away to some other parkrunners. As a tourist we went off with the group of other tourists and first-timers to hear about the course. Yes it was fairly hilly. There wasn’t a huge amount of people (140 people) so I started near the front. I just wanted to run comfortably and see how it went. As we started I got swept up in the race mentality but I looked at my watch and saw 6.30min/miles and thought “don’t be stupid”. As I slowed down four ladies pulled off ahead. I squashed any competitive need I had to try and follow them and reminded myself severely that I had a marathon the next day. The course was lovely and scenic, going round a pond with lots of ducks and geese walking around and it was a mix of tarmac and grass. It was very pleasant and the temperature was perfect. Yes there were hills but there were also down hills so actually it wasn’t bad at all. There was a young girl in front of me and as we passed a man he yelled at her “come on! There aren’t many more girls ahead!”. It wasn’t a supportive cheer, it was an instruction and I felt bad for the young girl (11-14 category). Come on, it’s parkrun for God’s sake! In the end I overtook all but one girl and got 22:20. She was really fast (and another 11-14 category – speedy young ladies!!). I know I wasn’t supposed to be racing but it was nice to come second and I felt very comfortable and not massively out of breath. The shin/calf did niggle slightly during the run but, again, no pain, no gait change, just an awareness and tightness. It didn’t feel any worse after running. I felt a bit calmer. I vowed to not touch it the entire day and sleep in compression socks that evening. After getting back to my granddad’s, showering and having breakfast we had the day to kill. My dad and me decided to do a bit of shopping and he wanted to show me some old haunts from his childhood. My granddad stayed at home, happy to see us later when we returned (he doesn’t go out a huge deal). Hilariously he gave us a map to take with us so we “wouldn’t get lost”. We took it with us but didn’t mention the fact that my dad’s car has a built-in Sat Nav or that my dad, having grown up there, knew the area quite well. Bless him! My dad and me joked somewhat wryly that it would be a bit of a disaster if I twisted my ankle or fell over on our little excursion! Thankfully we both made it up and down in one piece. The views were magnificent! We also later learned (after Googling) that there were some pretty amazing runs people did around the area (and up to the castle itself) and there’s a Mow Cop running club! Then we headed for lunch. We found a lovely little pub nearby that was just about to stop serving food but we managed to squeeze in just in time (it was after 2pm). 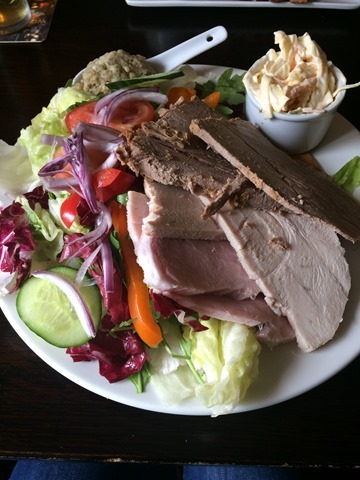 I had an EPIC cold meats salad. It came with roast beef, turkey and ham with stuffing. It was so tasty and filling! Don’t worry I made sure my evening meal was carbtastic with a standard pizza. My granddad had these cheap (86p!) pizzas he gets from Sainsbury’s which he then tops with a whole host of different ingredients. This is definitely my style of cooking! He also made a great mini-salad for me as he knows my love of vegetables. I made sure to drink lots of fluid (with nuun) throughout the day, especially as I was concerned of how warm it was going to be. It said 86% humidity on the weather forecast! Then it was time to just relax. We weren’t going to see my granddad the next morning as we were driving to Liverpool ridiculously early and then going straight back to Southampton from the race, so we said our goodbyes before going to bed. My alarm was set for 5am…ouch. But the race began at 10am and it would take around an hour to get there. I would need a coffee stop and we needed to get to the parking area before the 8am road closures…so 5am it had to be! …And the race recap will be along in another post I’m afraid! What do you do the day before a big race? Have you ever seen/heard some un-parkrun spirited behaviour from anyone before at a parkrun? How far have you had to travel (within your country) to a race/event before? Looking forward to your recap of the race! Haha, I love how you still finished second on your ‘easy’ Parkrun 😀 It’s such a shame about that poor young girl though…I suppose it was probably a parent yelling at her and that’s just terrible. I mean, I wish my parents had been tougher on me because I was such a lazy, lethargic sloth of a child, but that girl is going to feel such excessive pressure and might resent running later in life. She obviously has talent and it’s heartbreaking that she isn’t being allowed to experience the fun elements of running and just be free to pace to her own personal potential and satisfaction. I must admit that I don’t ‘get’ Parkrun and why it’s so popular (I must be the only person who doesn’t it seems…). I’ve traveled quite a long way on the train for the London Marathon, and survived a 4 hour car journey down to the Grim Reaper last year. My back won’t put up with long drives any more though, so I’m restricted to places we can get to in an hour or less. I just try not to have a nervous breakdown the day before a race. I wish I was joking! Argh so exciting for your recap!!!! I can’t believe you were 2nd lady at parkrun the day before a marathon! You are so speedy! What a shame about that girl though. At the parkrun I used to go to, it was a 3 lap course, and I did get shoved once when being lapped, and one runner always shouts stuff like “get out of the way” whereas most runners will say things like “passing on the left” or even just “passing/ excuse me”- it’t not a race and it drives me mad as they are just horrible. And I saw someone with a dog, and the dog was going to the toilet, and the woman was pulling it along, and left the poo on the floor (plus the poor dog was trying to go and she didn’t want it to stop)- that time I finished right behind her so I emailed the RD with her name (from the results) but they could only do a general reminder. At the new parkrun it has a better feel- I think because it’s off road and hilly there is little chance of a pb. Omg your dad is too cute! Those meringues look DELICIOUS. Yum! Chelsea @ Chelsea Eats Treats recently posted…WIAW #104 – It’s been a while!